KTMtwins.com KTM Motorcycle and Product News: KTM 950/990 Akrapovic Evo Slip-On System in stock now! KTM 950/990 Akrapovic Evo Slip-On System in stock now! What a sweet system. We were waiting for it and now it's here in limited quantities. 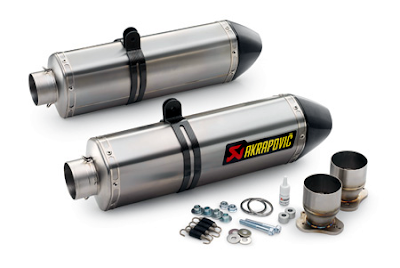 Get your Akrapovic Evo System today for your KTM 950/990 Adventure or 950 Super Enduro! Supermoto Wheels for the KTM 690 Enduro!